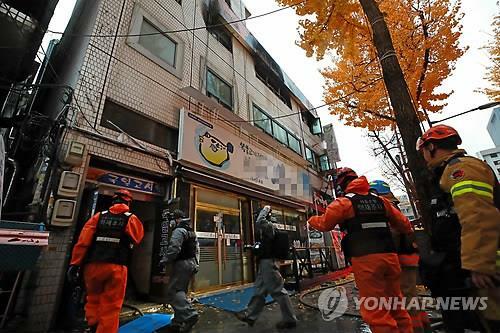 SEOUL, Nov. 9 (Yonhap) — A fire broke out at a low-cost dormitory housing facility in Seoul on Friday, killing at least six people and injuring 12 others, the local fire department said. The fire is estimated to have broken out on the third floor of the three-story building at around 5 a.m. in the central capital, according to the firefighters. It was extinguished at 7 a.m. There were 50 residents at the accommodation — commonly referred to as a “goshiwon” in Korean — which occupied the second and third floors of the building. The authorities said the number of casualties could rise. The local fire department said an investigation will be conducted to determine the exact cause of the fire.